I spent the day Monday with my friend J at the Puyallup Fair, a huge annual September event in the area here. Playing the day away on a MONDAY? Yes! “We play, while corporate America toils away,” we joked to one another. Whoomp whoomp! There’s something a teensy bit mischievous and naughty to me about goofing around on a Monday. It’s a day I’ve rarely have taken off from work in the past 15-20 years – most jobs have had staff meetings that morning, other weekly kickoff events or group huddles; it’s just always been a busy day where ya gotta be in the office! Honestly, I almost forgot it was Monday. I have been out of work for a couple months as my most recent contract finished up. While I continue to job hunt I’ve taken up a few new random activities (which I will likely post about later) and have – finally – embraced the discipline of unplugging and relaxing. Yes, that’s a discipline – at least for me. You see, I’ve worked in the corporate world fulltime nearly half the years I’ve been alive. It’s just something ingrained that I do and am used to doing…and hopefully will get back into a new gig in the near future. As I’ve said to so many before, I simply am not a good slacker! So what’s with the hands picture? J never goes anywhere without her camera, and that day at the Fair was no different. She encouraged me to get a bunch of random pics for this Blog and elsewhere – why not? 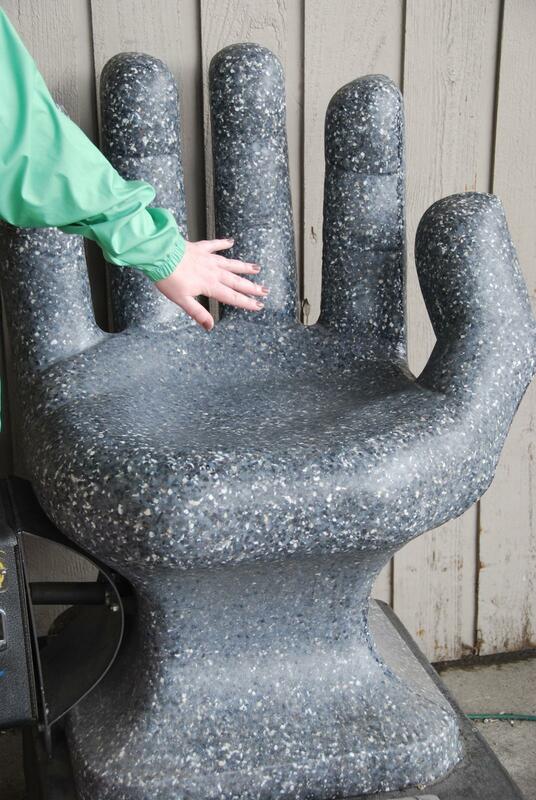 The big ol’ grey hand is a massager chair sort of thing, and they had these scattered throughout the fairgrounds. And while the pic was silly and random (yay!) there is seriousness in it too. I look at my tiny hand against the backdrop of the large one. Reminds me how there are so many other collective “hands” around for support through this temporary downtime…family, my friends both in real life and in virtual communities, former co-workers I’ve reconnected with and yes even God/The Universe too – the REAL big hands. Hands for a high five. A friendly wave. A handshake at an interview. A thumbs up. Hell, even a one-finger salute (yep, had a couple of those on the road this summer). What’s best of all? A handshake from a work colleague that turns into a hug. No matter what the future holds, I take comfort knowing the Hands are always there.